And so, I am back with a new chapter of my life and for this blog too. It is regarding that part of telecom that I never thought I would get a chance to learn or to work on. Anyways, so there I got a very good opportunity to learn about the complete Postpaid business, the technical and even the non technical facet of it. I would really love to pen down all that here on my blog because that’s something I just loved working on. 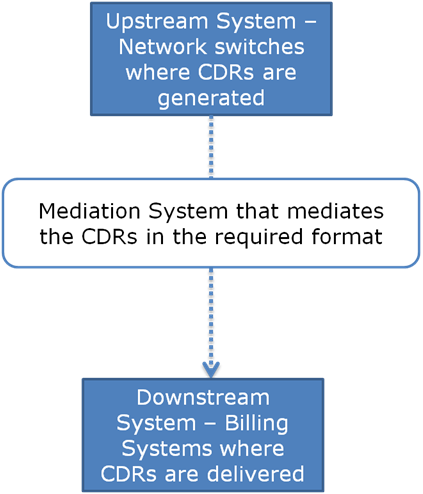 After the CDRs are generated, the role of Telecommunications mediation comes into picture. It is nothing but a process that converts call data to pre-defined layout that can be imported and recognized by the billing system. 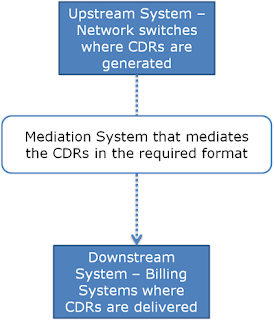 The Mediation System applies various rules on CDRs to process them, for example mediation system marks the international calls based on the dialed number (B-Number), same way mediation system marks the on-net calls based on A-Number and B-Number. The data in CDRs is in binary form. The billing mediation platform typically reads this data and converts into common normalized format. Billing Systems and all other downstream systems, in turn, converts this data to component an understandable format. The mediation system collects, collates and prepares data for consumption by the billing system, which often accept data only in a limited set of formats. Not all of the data transferred via billing mediation platforms is actually used for billing purposes. For instance, there may be a requirement to filter out all the calls which are having call duration less than 5 seconds, the best place to filter out such type of calls will be at Mediation System level. Same way if some extra information is required in the CDRs which is critical to billing then Mediation System will help in providing such information based on some other attributes available with-in the CDRs. Provisioning services for the subscription. Will take up how this billing happens in the next chapter and then will move on further to the marketing aspect of Postpaid as in how to do an analysis on the postpaid base, on churn, on other aspects. Videocon provide best prepaid postpaid service. A wonderful How-to-guide for non techies! Call at Vodafone Customer Care Number India Toll-free Number for technical help and Support. I appreciate the Post and I would like to read more good stuff keep it up! This is very nice article and have great information. Telecom Equipment Installation Services of AtelComs is good. wonderful information to share with non techies. Really nice information. Excellent. Really appreciate the manner in which it has been explained. How I wish I could have found this blog earlier. Keep up the good work and help us in enhancing our knowledge.